Imagine saving your company more than $4 million. That’s how much a senior living provider of 20 communities could expect to save every year by reducing turnover by 10 percent, according to Argentum’s latest study. 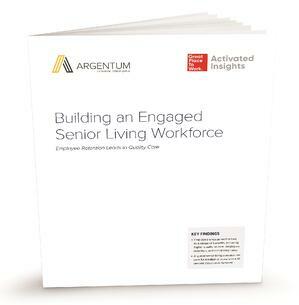 Published in conjunction with the Great Place to Work® Institute and based on data from senior living companies nationwide, Building an Engaged Senior Living Workforce demonstrates how employee engagement is tied to occupancy rates, turnover, risk expense, and more. Download your copy today to see more of what this study of over 400 senior living executives found.